Adding content, such as lectures and readings, to your class lesson is easy to do in Wet Ink. You can use handouts and worksheets that you might already have or create new text right in Wet Ink. The 'Content Block' section is where you would add lesson content directly into Wet Ink. Here you can add text, images, video, and even audio by typing into the content box or copying and pasting from a document. The formatting bar lets you change basic formatting of your font, add bullet or numbered lists, tables, hyperlinks, and dividers. When you add readings, it's treated as a special block of content within a lesson section. You can provide a link to a reading (such as if you are sending students to another site to read an article or short story) or you can upload a document (such as a handout that you have already made). 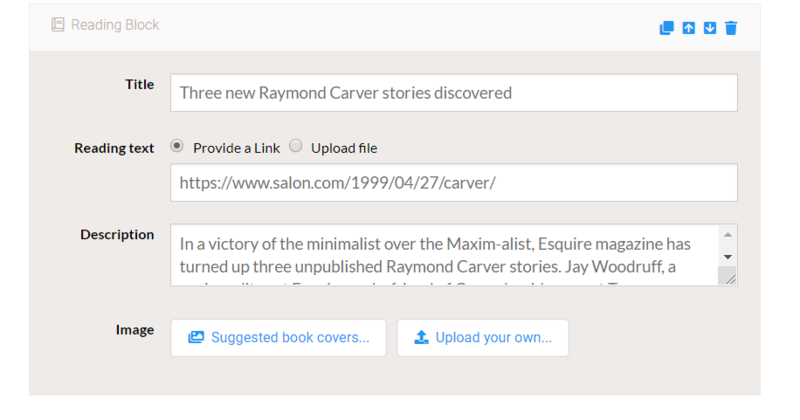 It will be added, and you'll be prompted to add details, including title, description, URL or file upload, and an opportunity to find or upload a book cover, if relevant.